The active electronic humidification system "Cigar Heaven" by Adorini sets new standards in the humidification of cigars. 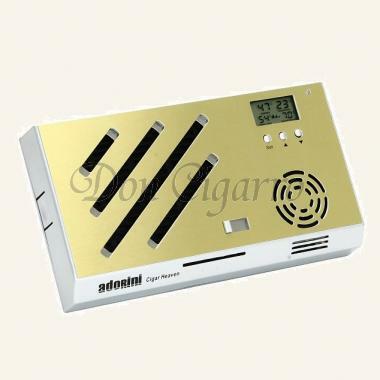 A very precise capacitive sensor ensures strict compliance with the preset humidity value, ensuring a permanent and perfect climate for your cigars. This Adorini humidifier is used in the world's most expensive humidor ever sold: the Cohiba Humidor auctioned at the Habanos Festival. It was sold for the price of 450,000 EUR. Several areas of the humidor were equipped with Cigar Heaven humidifiers. Nos you can now enjoy the same luxury in your own humidor!